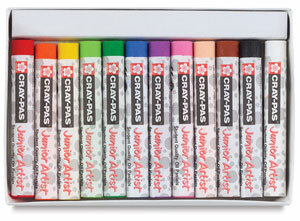 Individual pastels are round, measuring 2-3/8" × 5/16" (60 mm × 8 mm), and have paper sleeves. Non-toxic, they conform to ASTM D 4236. Individual Pastels — Each box contains 12 pastels of a single color. 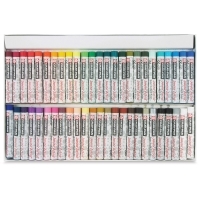 432-Stick Colorpack — The Colorpack offers a convenient and economical way for schools, camps, youth centers, and daycare centers to purchase, organize, and store Cray-Pas Oil Pastels. The sturdy cardboard box contains 432 pastels in all, 36 each of the following colors — Black, Orange, Purple, White, Yellow, Green, Cobalt Blue, Yellow Green, Pale Orange, Red, Pink, and Brown. Individual pastels are round, measuring 2-3/8" × 5/16" (60 mm × 8 mm). 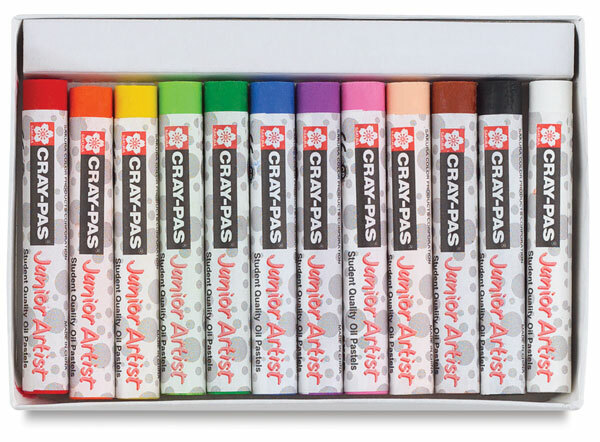 Cray-Pas "Chubby" Junior Artist Oil Pastels — These extra wide pastels measure 2-3/8" × 7/10" (60 mm × 18 mm), perfect for developing hands. Available in a 12-color set. 288-Stick Jumbo Colorpack — This Colorpack of 288 pastels contains 24 jumbo round sticks in each of the following twelve colors — Brown, White, Pale Orange, Purple, Cobalt Blue, Green, Yellow Green, Yellow, Orange, Pink, Red, and Black. Each stick measures 2-3/4" × 7/16" (71 mm × 10 mm).